"I will oppose any initiative to postpone the presidential election," declares Finance Minister. Yesh Atid chairman Yair Lapid announced on Tuesday that he is opposed to any initiative that would postpone the presidential vote. "I will oppose any initiative to postpone the presidential election. This is a legislative change that cannot be done quickly and at the last moment," said Lapid in an official statement. The comments come amid reports that Prime Minister Binyamin Netanyhau is making desperate maneuvers to try and prevent MK Reuven Rivlin (Likud-Beytenu) from being elected president. Current President Shimon Peres's term ends in July, and a successor is to be elected by the Knesset between 30 and 90 days before then. Netanyahu reportedly is still trying to bring about a six-month postponement of the election, after failing to do so until now. Sources close to him said this week that he seeks to use the time to legislate a change in Israel's system of government and election. 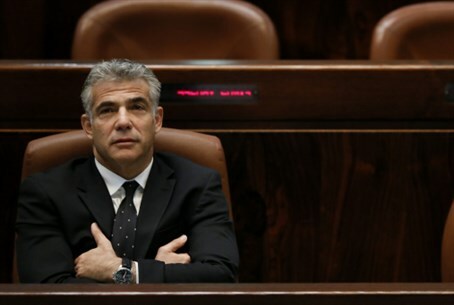 Lapid is the first one among Netanyahu’s coalition partners who have publicly said that they would reject any initiative to change the current method of electing the president. So far, several members of Netanyahu’s Likud party have publicly expressed their opposition to Netanyahu’s move, including Interior Minister Gideon Sa’ar and MKs Miri Regev and Haim Katz. Defense Minister Moshe Ya’alon hinted on Tuesday that he, too, was opposed to the idea, and in any case clarified he was in favor of maintaining the post of president. Hatnua chairwoman Tzipi Livni and Jewish Home chairman Naftali Bennett have yet to make public their position. The two were reportedly investigating the possibility of joining forces to cancel the post of President, but given Lapid’s position and his heading the second largest party in the Knesset, the chances of the initiative passing are slim.